Having a child brings a whole. New. World. The world of education. When do you start teaching them things? What do you teach? Should they go to pre-school? Public school? Home school? Private? So many questions!!! Well that’s WAY too many questions to answer right now. But I do know that as of now I am planning on homeschooling and honestly it’s already starting. It’s nothing fancy or really structured. It’s just being intentional and interacting with her. I do have this book that I got when Abigail was first born. I am for the Montessori methods at the young ages, for the most part. It’s an awesome book that explains a lot of their development. I also got this book. You know that dvd set, My Baby Can Read? Well, this book is from the actual institute and guy that stumbled onto this concept of teaching kids to read. It’s extremely informative and I couldn’t put it down!! 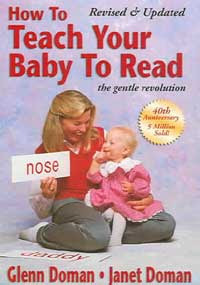 It lays out all the steps of how to teach your child to read and all the benefits for their brains when doing that. Here’s a few things I have for Abigail right now. 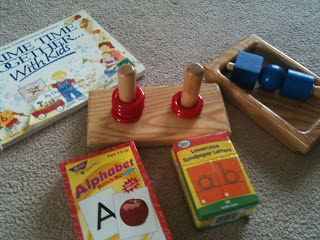 I have a couple Montessori toys for her and a book that has tons of crafts and ideas. Then I have cards that are sand paper letters and cards with pictures on them. Here are those cards. I am so excited to use them with her! I have heard a lot about that program and a couple of my friends have it now. One of my friends who has it doesn’t really use it anymore, but today we decided to put our girls in front of it. After looking at everything, the books and dvd’s, I have concluded that I like it but I don’t. I don’t like putting my child in front of the TV for 25 minutes straight and expecting her to watch it all. I do like the books and cards though. Kyle and I decided before Abigail was born to not have her watch TV at all for the first couple years of her life at least…not that it won’t ever be on. But I mean put a show on just for her and sit her in front of it. It’s extremely bad for their ability to learn and causes lots of issues. Everything I’ve read has said that there’s no reason for a child 2 years and under to watch TV. So true! They don’ know anythings about it. We as parents are usually the ones to introduce it to them. It’s usually by our laziness that we sit them in front of it. So when I sat in front of the My Baby Can Read, I cringed. I know it’s educational but I don’t think it’s necessary to teach her that stuff through the television. I can teach her the same stuff without it. Will it take more time on my part? Yes. Will it be inconvenient sometimes? Yes. Will it not give me a “babysitter” when I want to get a few things done. Yup. But the truth is, I’ve been fine without it the whole time! I enjoy not turning on the TV everyday. I like listening to music or just playing in silence. That’s ok. 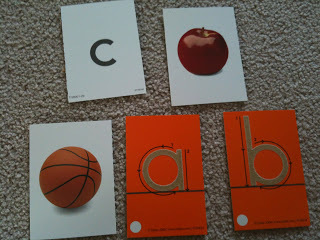 There is a blog that I really like that is Montessori based, http://1plus1plus1equals1.blogspot.com/. I really like the blog, but it can be a bit overwhelming.